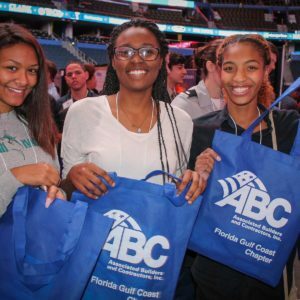 The 2017 Build Tampa Bay​ event was not only transformative for our industry, but for the lives who learned of a career path that would be mutually beneficial both to their future and the community in which they live. We will continue to spread the word of the amazing opportunities and companies in construction as Tampa Bay continues to exceed expectations in growth and lead Florida in growth towards the future. Associated Builders and Contractors (ABC) is a national construction industry trade association representing more than 21,000 members. Founded on the merit shop philosophy, ABC and its 70 chapters help members develop people, win work and deliver that work safely, ethically and profitably for the betterment of the communities in which ABC and its members work. ABC’s membership represents all specialties within the U.S. construction industry and is comprised primarily of firms that perform work in the industrial and commercial sectors. ABC was founded in 1950 when seven contractors gathered in Baltimore, Md., to create an association based on the shared belief that construction projects should be awarded on merit to the most qualified and responsible low bidders. The courage and dedication of those seven contractors helped to quickly spread the merit shop. Today, ABC is recognized as one of the leading organizations representing America’s business community and the merit shop construction industry.